I don’t eat quinoa because it is healthy. I eat it because I like it, and because it is versatile, and has a fun, popping texture. The fact that it is healthy is a plus. I would never eat something that was good for me if I didn’t truly enjoy it; I think most good food is healthy anyway, and becomes even better for you if you draw pleasure from eating it. I usually start off any quinoa recipe by rinsing my quinoa thoroughly to get rid of the bitter saponins that coat it (I prefer the red for its nuttier taste, my husband the white for its lighter flavor) . Then I drain it, plop it in a saucepan with double the amount of water, throw in a crushed garlic clove, a bay leaf, a sprinkle of salt, and a bit of freshly ground black pepper. When the water comes to a boil, I cover the pan and simmer the quinoa until the grains are swollen and all the water is absorbed, about 15 to 20 minutes. Then the quinoa can be eaten hot, instead of rice or potatoes or any other starch; cooled and transformed into a salad with bits of feta cheese, diced tomatoes, charred peppers, and olive oil; flavored with plenty of herbs and folded into lettuce leaves for a refreshing bite; or bound with a bit of egg as below and pan-fried into delectable little cakes, so good with a fresh salsa of summer corn and ripe tomatoes. Since I especially love quinoa with peas (they add such a sweet note and vibrant color), I often add about 1 cup of thawed petite peas to the quinoa in the last 3 minutes of simmering, as I did for the recipe below. 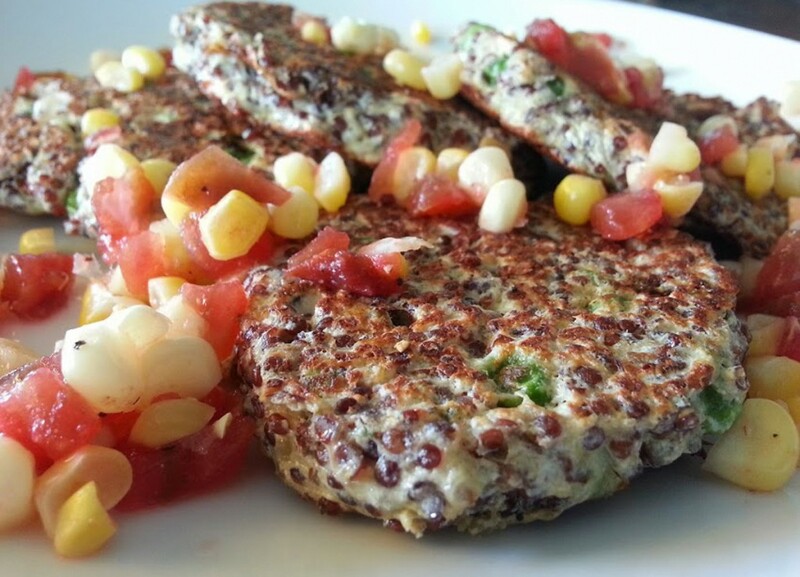 The recipe here yields enough quinoa for several dishes; you only need one-quarter of the total amount for the quinoa cakes, so experiment with the rest. 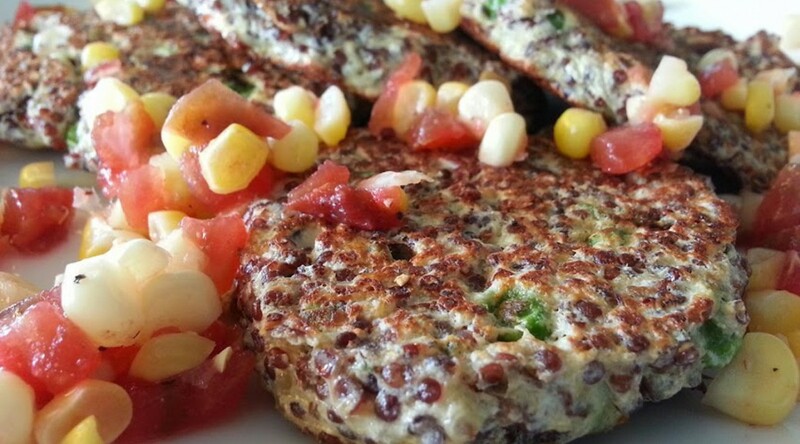 Try swapping these quinoa cakes for the meat patties in your burgers at your next barbecue. I think even the carnivores would enjoy them; my husband did! Make the quinoa: Place the rinsed and drained quinoa, the water, bay leaf, garlic, salt, and pepper in a 1-quart pot. Set over medium heat and bring to a boil. Cover, lower the heat to simmer, and cook 15 minutes, then add the peas and cover again. Cook another 3 minutes, or until the quinoa is tender and the water has been absorbed. Remove from the heat and keep covered for 10 minutes. Discard the bay leaf and adjust the salt if needed. Transfer one-quarter of the cooked quinoa to a bowl. Reserve the rest for another use (see introductory notes for additional ideas). Make the cakes: Add the egg, Ricotta, marjoram, salt, and pepper to the measured quinoa. Stir well. Make the salsa: Bring 2 cups of water to a boil. Drop in the corn. Cook 3 minutes, then drain, cool, and cut the kernels off the cob. Toss with the tomato, salt, and pepper, and taste for seasoning; adjust as needed. Cook the cakes: Warm a 10-inch non-stick skillet over medium heat for 2 minutes, or until hot but not smoking. Brush with 2 teaspoons of the olive oil. 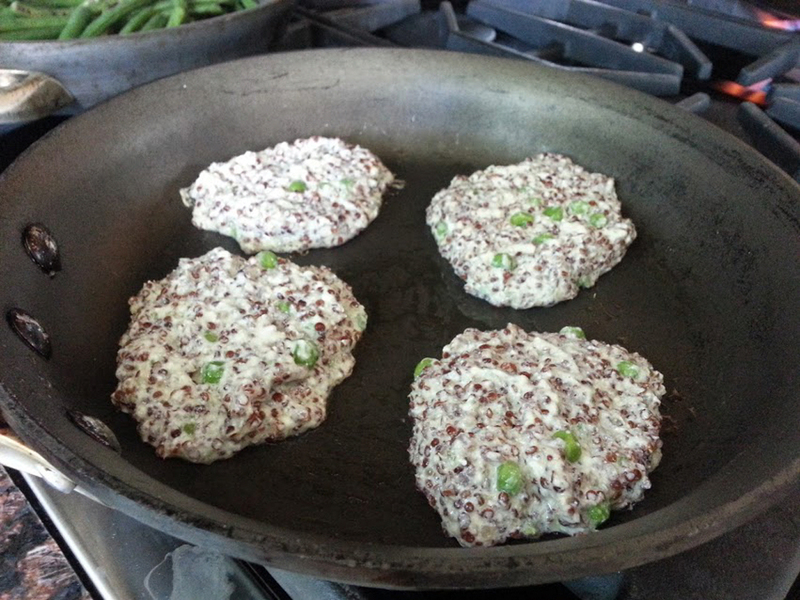 Divide the quinoa cake mixture into 4 equal parts and drop into the hot skillet, shaping it into 4 even pancakes. Cook 3 minutes, or until golden brown on the bottom and starting to set on the top. Brush the tops with the remaining 2 teaspoons of the olive oil. Flip and cook until golden brown on the other side. Place on a platter. Sprinkle with the salt. Serve hot, topped with the salsa.